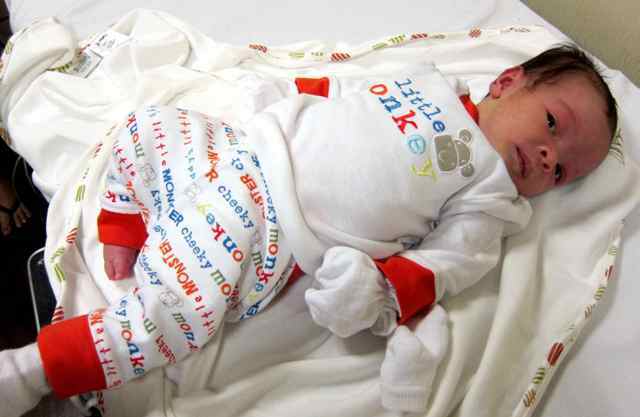 Our baby is called Atom and was born July 30, 2010 in Makati Medical Center, Manila, Philippines. At birth Atom weighed 5 lb 13oz or 2,637 grams. He was born after 39 weeks and 4 days. Atom is half Filipino and half English. 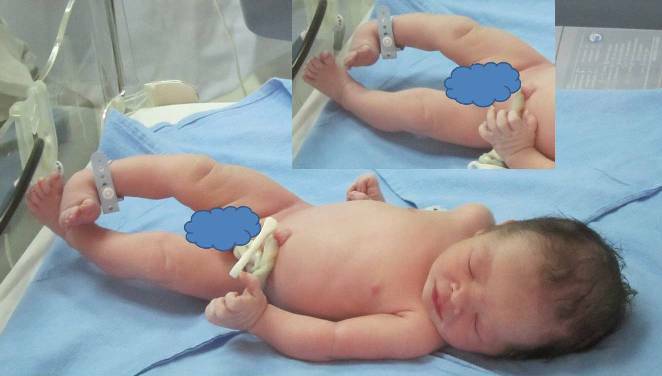 He was born by cesarean section and his clubfoot, on his right leg only, was picked up immediately at birth. Previously Atom had had twelve ultrasounds (including one very detailed one with video) and his clubfoot was not picked up. In some ways this is good as we would have worried unnecessarily, but had we known we would have been able to research and prepare better. His foot was fairly rigid at birth. At first we worried if his clubfoot was the tip of the iceberg with other possible related problems, but our doctor assured us that he seemed fine and normal. This page is a journal of his treatment. 1 day old (31 July 2010): Consultation. Within 24 hours of the birth of Atom we discussed his foot with an orthopaedic doctor. 2 days old (01 August 2010): Cast #1. The orthopadic doctor set a plaster cast on Atom's foot in order to start the process of correcting his foot. The orthopaedic doctor predicted a full recovery. The casting process didn’t hurt Atom. There was some crying as Atom was moved around and the cast set, but once in place Atom was very peaceful. 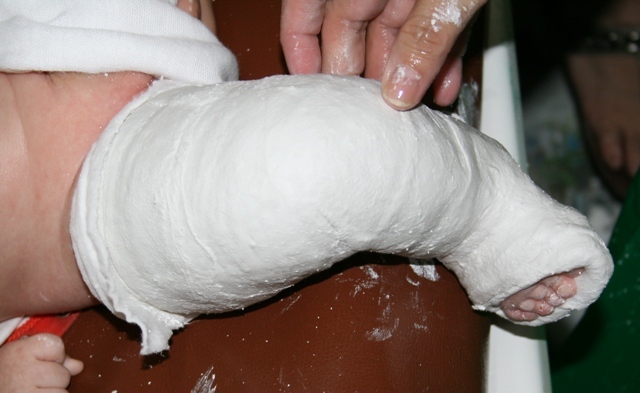 1 week old (06 August 2010): Cast #2. Atom remained in hospital so the orthopaedic doctor and his assistant removed Atom's cast using a water/vinegar mix. Neither us nor the nurses were allowed to remove the cast this way whilst in hospital, so we ended up hanging around for 5 hours. Atom had just been fed before his cast was removed, so slept through this procedure! Then the orthopaedic doctor manipulated Atom's foot. We had a few tears, but Atom made good progress and a second cast was made, again to be changed in a week. Atom's foot was becoming more flexible. Atom was discharged from hospital today. 1 week, 6 days (12 August 2010): We went for a routine visit with our pediatrician. On seeing the swollen toes the decision was made to loosen the cast immediately. The orthopaedic doctor's assistant then cut away an area around Atom's toes and the swelling decreased later that day. 2 weeks, 1 day old (14 August 2010): Cast #3. We had to remove Atom's plaster cast before seeing the orthopaedic doctor. We used water and a small amount of vinegar, splashing it over the cast. It took nearly 2 hours to peel and cut off. Sometimes Atom cried, other times he slept! When the plaster was off we were amazed at Atom's progress. We had breakfast and then went to see the orthopaedic doctor. 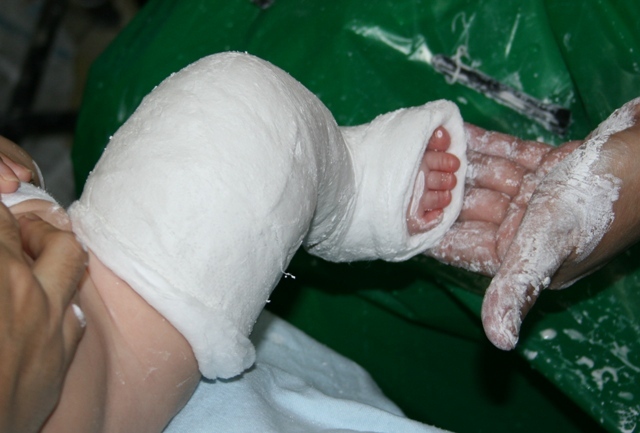 They were also impressed with Atom's progress and placed Atom in one final plaster cast before he moves onto splints. Atom didn’t like being measured for the locally made splint. 3 weeks old (20 August 2010): Cast removed (wait on splint). Atom's final cast was remove today. As we were not happy with the time it took to remove with water/vinegar last time we had the plaster sawn off at hospital. We are all happy to see the progress of Atom's foot! His splint was not yet ready so Mum was advised by the orthopaedic doctor to massage Atom's foot as often as possible to maintain the correction until the splint becomes available. 3 weeks, 3 days (23 August 2010): Cast #4. Mum was not happy that, despite the massaging, Atom's foot was moving back towards it's former position. Atom wanted to curl the foot back to where it was most comfortable. We decided to meet the orthopadic doctor and have Atom re-cast. In the afternoon we went to hospital for Atom's fourth plaster cast. The orthopaedic doctor was happy that Mum brought Atom in early. Atom cried during the whole casting procedure. The orthopaedic doctor and the nurse had to hold Atom tight as he was kicking really hard. After the hospital visit, Atom seemed so tired that he was able to sleep soundly. 4 weeks, 1 days old (28 August 2010): Splint #1. The orthopaedic doctor removed your fourth and final cast today. Just like last time, Mum was scared of the saw used to remove Atom's cast but he was brave. Atom stayed calm. Atom only cried when the orthopaedic doctor was removing the cotton part of the cast. He then put on Atom's splint, which is made of fiber glass. Whilst in the clinic, there were 3 other babies that had club foot. Seeing their improvements, Mum was so hopeful that Atom's foot will be normal in a short span of time. After a few days, Mum was not happy with the locally made splint and following more research the decision was made to meet with another doctor who had been trained by Prof. Ponseti. 5 weeks, 4 days old (07 September 2010): Consultation (new doctor). Today Mum took Atom to see Dr Julyn Aguilar who specializes in clubfoot. Mum was impressed as she is the only doctor in the Philippines following the Ponseti method precisely, having been trained by Prof. Ponseti. Mum and Dad decided to follow her advice and have Atom put back in plaster. Atom's foot had been partially corrected, but needed to be over-corrected before being placed in a brace, as clubfoot tends to recur. Dad ordered some special undercast cotton (Webril) from America, which will hopefully arrive in time for Atom's first new casting due on September 16th. Atom on 06 September 2010 when briefly taken out of his splint. 6 weeks, 6 days old (16 September 2010): Cast #5. In the afternoon Mum took Atom to St. Lukes Hospital in Quezon City to see Dr Julyn Aguilar. The Webril hadn't arrived, but Dr. Aguilar had some spare. She put a plaster on Atom but he was very resistant and kicking so the first lot of undercast cotton was wasted and she had to start again. Mummy was told to feed Atom first next time, but I still suspect there will be lots of crying and fighting with the doctor! The cast looks good, but is quiet heavy (heavier than the last ones). Since having it on, Atom has cried a lot – I think he got used to having his leg free to kick around! 7 weeks, 6 days old (23 September 2010): Cast #6. It’s plaster cast change day today! We soaked Atom's whole bottom half in a bucket of two thirds vinegar and one third water. Dad bought loads of tools to help remove Atom's cast, but in the end some simple bandage scissors (from National bookstore) helped the most. Plaster removal scissors proved impossible to obtain in the Philippines. This time Atom's plaster came off reasonably easily. Atom wasn't overly happy about the 30 minute soak in vinegar, but after the bath when he was out of his cast he was happy. We went to St Lukes Hospital in Quezon City to see Dr Julyn Aguilar. The Webril undercast had now arrived (via a cousin in New York). Mum deprived Atom of milk until Dr Aguilar started putting on his new cast. He then had a bottle of Mum’s milk whilst the plaster was put on and he was like an angel. Atom only cried a little once he was done feeding, but by that time the cast was almost finished. Everyone was very happy with Atom! At night Atom struggled to get to sleep - possibly bothered by the slightly damp plaster that takes 24 hours to fully dry. 8 weeks, 6 days old (30 September 2010): Cast #7. Today we took Atom's cast off. We used mainly vinegar, topped up with a little warm water and put him in his 'pickling' bucket! Mum managed to remove Atom's cast in just 20 minutes today. At hospital, we had to wait two hours as the previous baby pooped everywhere – he was having two clubfeet done so a much harder job! We also looked at Atom's feet and his clubfoot is still slightly smaller than the other – maybe 7mm or thereabouts, but looking better than before. By the time the doctor saw Atom he was starving! Atom fed whilst Dr Julyn Aguilar fitted his new plaster cast. This time Atom's foot was being over-corrected for the first time. Dr Aguilar was very pleased with Atom's progress and said he may not even need the minor operation to lengthen his Achilles tendon. We’ll have to see though as Atom has 2 or 3 casts, at least, to go. Due to the new damp cast, we were expecting Atom to be awake much of the night, but he was tired out and slept well. 9 weeks, 6 days old (07 October 2010): Cast #8. Today we got the old cast off in a record 14 minutes by soaking in vinegar. The foot had made excellent progress! Atom's normal left foot is 82mm long, whilst his right club foot is 76mm long, so 6mm shorter. At the hospital Dr Aguilar was also impressed with the progress and said that Atom would not need a tenotomy (tendon cutting). Whether the baby has this minor procedure or not does not impact on the chances of success - it's about the same. We were therefore pleased that Atom's progress meant he did not have to go through this procedure. The first cast attempt was abandoned. Atom was in earlier than expected (no wait this time) and so was not hungry. This resulted in a lot of kicking. Atom also pooped, which did not help proceedings! After he was settled down for half an hour we tried again and he slept through most of the casting procedure. He wasn't keen on the initial manipulation of his foot, but slept once it was in position. This cast is now the second to last cast that Atom will have and as you can see the over-corrected position looks good. 10 weeks, 6 days old (14 October 2010): Cast #9. Atom's old cast came off easily today - it took about 9 minutes start to finish in the three quarters vinegar solution. We've really got the hang of this now! His clubfoot is still slightly smaller - about the same as last week. I measured 77mm for the right clubfoot and 81mm for his normal left foot - his left foot hasn't shrunk - it's just difficult to measure as he curls his toes! We then went to the hospital to see Dr Aguilar. Atom tried some shoes out to determine which size to order. We were instructed to order one pair of Ponseti AFO size 00 shoes (cost approx. US$264) and the appropriate size Ponseti Brace (cost approx. US$86). To do this we email Bittany Davison or Emily Ferguson at mdortho@farmtel.net and have the braces sent to the hospital. The company is MD Orthopaedics Inc, P.O. Box 125, 604 North Parkway Street, Wayland, IA 52654, USA. Tel 877-766-7384 or 319-256-5656. Fax 319-256-2501. It was best to try the shoes out, but they also have a foot measuring chart. Atom did not require a tenotomy, which we were pleased about. Atom then had his final cast put on, which will be on for two weeks as we wait for the braces. Atom was hungry as we travelled to the hospital and we had a few tears as we only gave him a sip of milk. This paid off as he was preoccupied drinking milk during the cast setting. It all went smoothly this week, unlike last week! ABOVE: Cast #9 (Atom's fifth cast with Dr Aguilar). This will be his final cast before he gets braces! 12 weeks, 6 days old (28 October 2010): Ponseti AFO Braces. Today Atom had his final cast taken off. We used our usual technique with a lot of vinegar and it came off quickly with no fuss. Atom's foot looks a lot better now... just like a normal foot. Then we went to St. Luke’s for Atom's orthopeadic shoe fitting. This is needed to maintain the correction made to Atom's foot. Dr Aguilar taught Mummy how to put on Atom's shoes. Atom will be wearing the shoes (yes, shoes since his normal foot will need to be in a shoe too) for 23 hours everyday for the first 3 months. One hour is for bathing time and for putting the shoes on only! 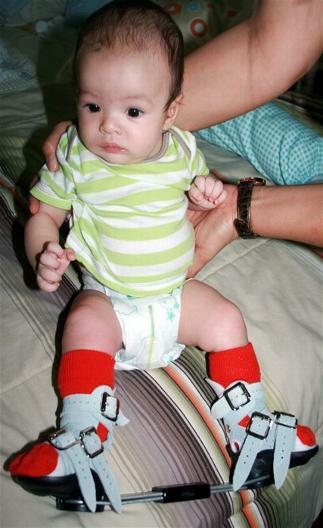 Atom is in a Ponseti AFO Brace, which was developed by John Mitchell in consultation with Dr. Ponseti - thus it is also known as a Mitchell Brace, and he is set at 60 degrees for his right clubfoot and 50 degrees for his normal left foot. When home, Mum put on Atom's shoes as per the doctor’s instructions. Mummy had a hard time putting them on at first. Atom cried a little, but we think it was because he was just tired with the day's activity. At night Atom slept well because of the full day of experiences! The next day Atom was difficult as he was still adjusting to his new shoes/braces. He cried a lot. He even pooped a lot. His Grandfather/Lolo thought he was stressed. Come afternoon Atom tried to settle a little as long as Mummy didn't put him down. 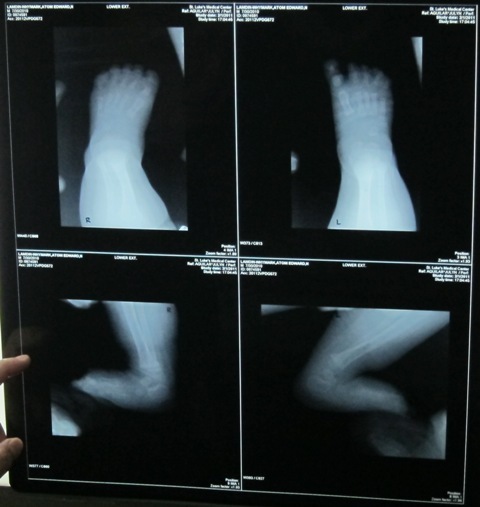 ABOVE: Atom's feet immediately after his cast was removed and then being examined by Dr. Aguilar on 28 Oct 2010. ABOVE: Atom in his braces on 28 October 2010 and his feet later on 09 November 2010. 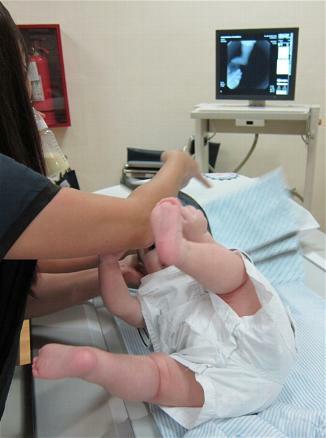 It is Atom's Right foot which is the clubfoot and it is slightly smaller than his normal left foot. 14 weeks, 6 days old (11 November 2010): Check-up. Today we went to St Luke's for Atom's scheduled check-up with Dr Aguilar. She's very happy with the progress of Atom's foot. No need for a tenotomy she said. Mum is happier because Atom won't have to go through an operation. Atom's doctor also taught Mum how to do the therapy on his foot whilst he is on his 1 hour of freedom from his braces. Also we are less worried about his apparently bent little toe now he is out of the cast - it looks much straighter. ABOVE: Atom's feet on 11 November. His right foot is the clubfoot. ABOVE: Atom's foot still looks great on 27 November 2010. 19 weeks, 6 days old (16 December 2010): Check-up. Atom had a check-up today. His feet had remained good in the brace, confirming that he did not need a tenotomy. In fact it is becoming hard to tell his feet apart! Dr Aguilar told us that we should be massaging and tickling Atom's feet when he is out of his braces, 'walking' is also good. The massaging involves holding the foot in the middle (not by the toes) and pushing it up whilst straight. This stretches the tendon. Mum was a bit concerned that Atom's left, normal foot, was pointing out too much when he was 'walking' (whilst being held). We were informed that as the number of hours in the brace are reduced the foot will come back to a straight position. 23 weeks, 6 days old (13 January 2011): Check-up. Atom had another check-up today. He is doing well, but needs larger shoes. In the evening we ordered size 1 ponseti shoes. 26 weeks, 4 days old (01 February 2011): Check-up. Atom went for an x-ray today. He was not very co-operative as he was full of energy, but we managed to get the required x-rays (with 3 people holding him in position). After the x-ray we saw Dr Aguilar. His foot is not perfect, but it is probably as good as we can get under the circumstances. Atom's time in the brace will be reduced to 16-18 hours a day (mainly when he is sleeping and not necessarily all at once). We will continue to massage his feet. A few days ago we bought him a walker, but Dr Aguilar advised us not to use it as it can cause bow legs - instead we should wait for him to start walking naturally. We also measured Atom's feet again today and his right clubfoot was 92 mm length whilst his normal left foot is 99 mm in length. 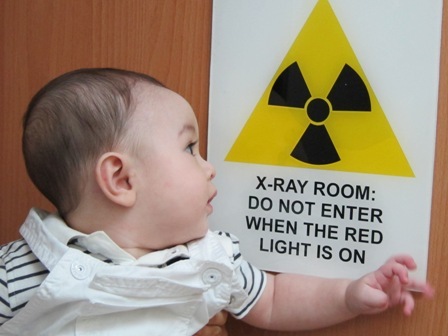 ABOVE LEFT: Atom's feet - He has a right clubfoot; ABOVE LEFT: Atom having fun in the x-ray room! ABOVE: Atom did not co-operate during the x-ray! He was full of beans and it took 3 people to keep him in position! ABOVE: The x-ray on 01 February 2011. Atom's right foot is his clubfoot. ABOVE: Atom tries on his new size 1 shoes! 30 weeks, 4 days old (01 March 2011): Check-up. Atom is doing just fine. When Atom is out of his braces we are reminded to massage Atom's right club foot and tickle the outside of his foot so he brings it around straight. Also when putting on his shoes we need to ensure his toes are straight in the shoe. We must also continue to strictly have Atom wear the Ponseti Brace for at least 16 hours a day. Next check-up in three months! Also I measured Atom's feet a few days back. 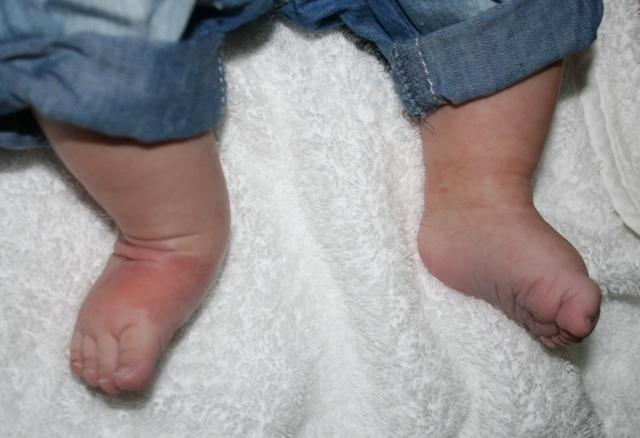 His left normal foot was 97mm in length and his right club foot was variably 92 mm or 97 mm, largely dependent on whether his toes were curled (and they do tend to be a little more curled on his club foot). So, it looks like his feet are more similar in length now, with his club foot still perhaps slightly smaller, but maybe catching up. I know the numbers vary a little, but wriggly babies are hard to measure precisely! ABOVE: Ensuring that Atom's toes are straight in his Ponseti shoes. 43 weeks, 6 days old (02 June 2011): Check-up. Atom's feet are doing good. No need for new shoes right now. We continue to have Atom in braces for 12 hours a day (basically overnight and early morning) and we are instructed to continue Atom's foot exercises. If you look at him today you'd never guess he had a right club foot! In detail his toes are a little curled up, but basically he is totally normal! 13.5 months old (22 September 2011): Check-up and new shoes. Atom's feet are doing good, but he has grown. About a week ago we ordered a size 2 shoe for his right club foot and a size 3 shoe (which is loose) for his left normal foot. This will save a little money as when his right foot grows he can use the size 3 on his right club foot. Today he had his shoes fitted and went on his way. He continues to wear his braces for 12 hours a day. ABOVE: Atom's feet at 34.5 months old (nearly 3 yrs old). Right foot is the clubfoot. Left is normal. ABOVE: Atom's footprint at 34.5 months old. 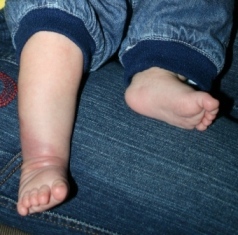 His right clubfoot is shorter and wider when compared to his left normal foot. 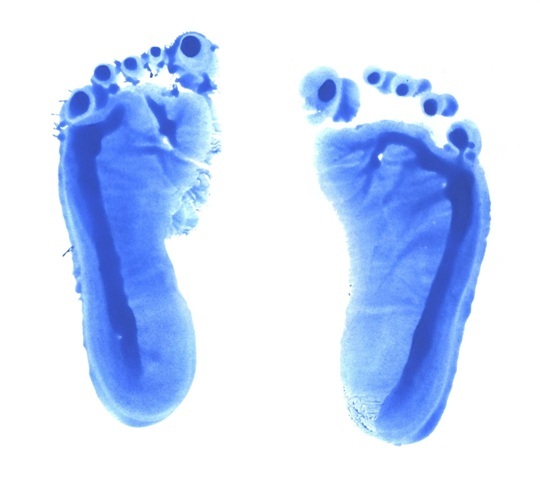 You can compare this footprint with his new born baby footprint on the home page - it looks much better.